Timely, authoritative, pedagogically consistent a valuable professional resource and a superior didactic tool. 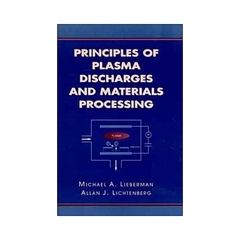 Authored by two internationally respected pioneers in the field, this book offers a fully integrated, pedagogically consistent presentation of the fundamental physics and chemistry of partially ionized, chemically reactive, low-pressure plasmas and their roles in a wide range of plasma discharges and processes used in thin film processing applicationsespecially in the fabrication of integrated circuits. With many fully worked examples, practice exercises, and clear demonstrations of the relationship of plasma parameters to external control parameters and processing results, this book combines the best qualities of a student text and a professional resource. Basic Plasma Equations and Equilibrium. Chemical Kinetics and Surface Processes. Particle and Energy Balance in Discharges.